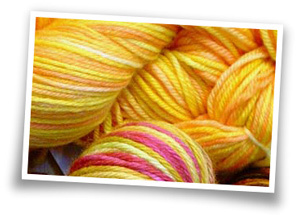 Mohair is famous for its insulating properties, softness and distinctive appearance. Traditionally, the wool comes from the Angora goat, a special breed native to Turkey. The goats are washed before they are sheared to remove debris and soiling from their hair. After shearing the mohair is washed again before it is combed and carded with fine brushes to remove the short hairs while at the same time the process aligns the fibres so they all face in one direction. The carded hair is then split and spun into yarn. Depending on the skill of the spinner a smooth yarn can be produced either thick or thin, to give a variety of finished appearances. 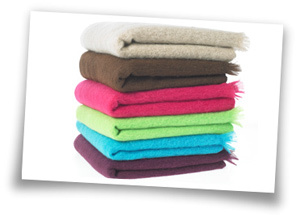 Why choose Mohair: Approximately half the weight of a normal wool throw, strong, vibrant colours and extremely warm for its weight. Cashmere is a luxurious wool that comes from the Kashmir goat. Traditionally Kashmir goats are raised in Mongolia, but many are now bred in Iran, Tibet, India and China. The wool is harvested from the goats during their annual moulting season. The finest cashmere comes from the underbelly and throat of the goat. This quality of wool is especially soft and is less likely to pill during wear, making it suitable for garments worn 'next to the skin'. The remaining wool - from the legs and the back, have shorter fibres and this can be used to make a less expensive yarn. Cashmere comes naturally in white, grey and brown but can be easily dyed to meet current fashion shade requirements. Wool is a dense warm coat from a variety of breeds of sheep and known as a fleece. It is durable, warm, naturally flame-resistant and has properties that allow it to stretch up to 50% when wet and around 30% when dry. 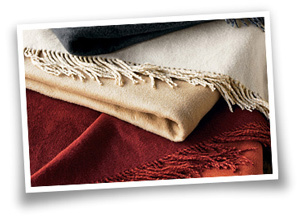 Its wicking properties draw moisture into the core of the fibre, giving our throws a natural shower proof type finish. After the fleece has been removed from the sheep, it is washed and then, if required, blended with other varieties of wool before being dyed. Carding pull the fibres straight then the long slivers are combed and drawn before spinning. Occasionally we will add a small amount nylon to the wool before spinning. This gives the finished cloth added strength and dimensional stability. Why choose wool/wool blend: Value for money, hard wearing throw suitable for a variety of uses around the home or on vacation.